Street animals have hearts too! Ask anyone who has been to Thailand and they will tell you that the streets are inhabited by endless packs of dogs and cats (and goats, monkeys, cows… I’ve even spotted a rogue pig or two chilling on the roadside). These animals live in a variety of levels of comfort, cleanliness and happiness but luckily the majority of animals that I see living on the streets are relatively well fed, clean and have a seemingly happy existence. As there are countless animals on every street corner, the Thai people are very used to them being around. Elderly people going on their evening after-dinner walks are usually armed with a stick in case they come across any dangerous dogs but usually they are placid and barely cast a sideways glance at you before returning to their snooze. Despite living on the streets, these animals (the dogs especially) seem to be un-bothered by the motorbikes, cars and pickup trucks that drive along the roads and usually like to snooze smack bang in the middle of the street. Most drivers casually drive around them or toot their horn to get them to move. Yesterday was the second time that I’ve seen a dog being hit by a car (not including the countless times I’ve seen the aftermath of such a thing laying in the road) and what made it worse this time was that it was our dog. That’s the thing about street dogs; they may not have a home but they will have a section of the street that is theirs, and any homes that fall into that section automatically become part owner of said dog, providing food with leftovers. Khao is a dog old before his years. 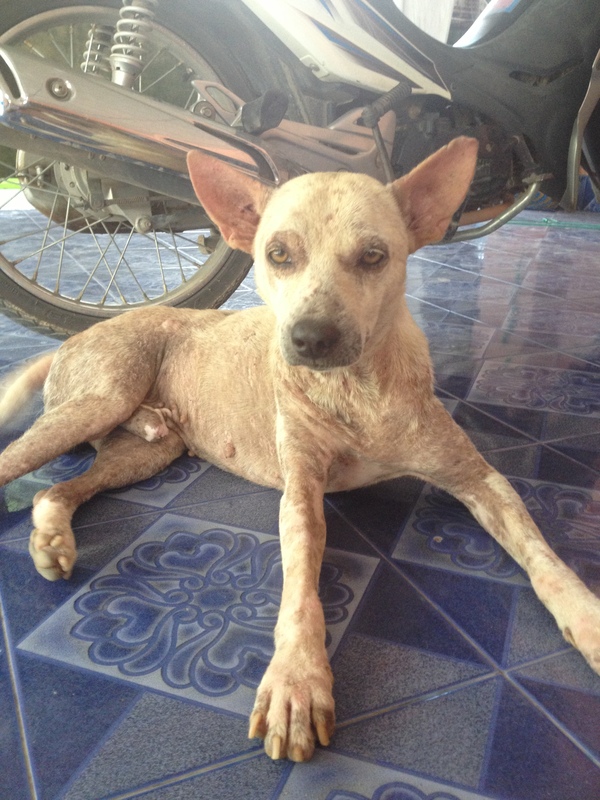 Life on the streets has given him a tired appearance and his once white fur (hence the name Khao – Thai for white) is now dirty. Over the past few months we have been feeding him regularly (he’s now on a comparatively gourmet diet of actual canned dog food) and he is looking and acting so much better. Tom even went to the vets and they gave him sedatives so that he could give him a proper wash (Khao is really scared of water). When we brought Patches home as a puppy he finally had a dog that he could call a member of his pack. 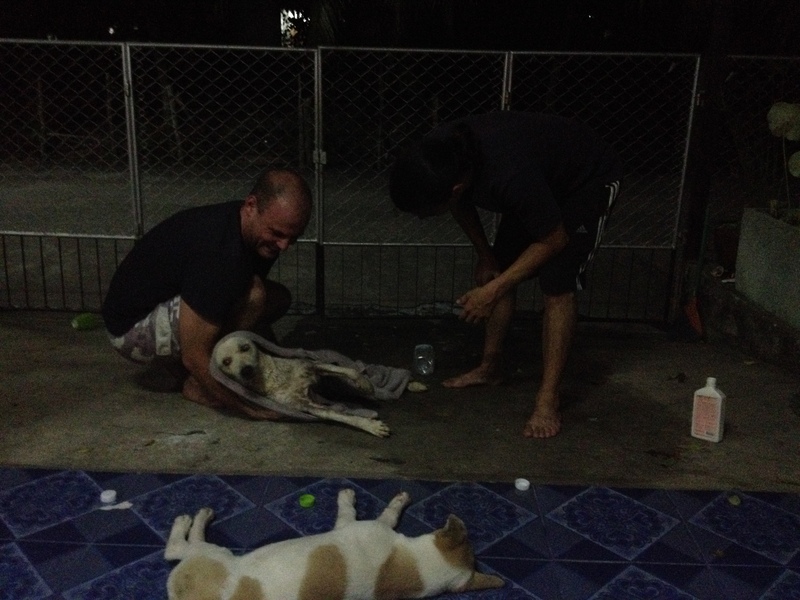 Yesterday lunch time Khao was sleeping in the middle of the street, as three or four dogs usually do. A pick up truck full of builders was driving along and slowed down when they saw him. But this time, instead of driving around him or beeping their horn, they carried on approaching him and just didn’t stop. So instead of realising that this dog couldn’t hear them coming and stopping or changing course along the road, they drove right over him and carried on as if nothing had happened. Obviously Khao woke up with a start and yelped, and we realised what they had done. By the time we were outside Khao had limped off to hide in the bushes and the truck was gone. After an hour or so Khao made his way back to our house and came right into our front yard. His back feet and ankles were bloody and he couldn’t put much weight on either one. His groin was all swollen and bruised too, and he just kept looking down at his injuries and trying to lick them. When we saw his injuries it became apparent that a mysterious groin and leg injury that Patches had a few weeks ago was probably from a run in with a vehicle too. This morning when we woke up he was gone from the garden and to be honest I thought he may have gone off somewhere to die. But we found him around the corner sheltering, probably because his injuries mean he won’t be able to fight off any other dogs that he might run into in the night. It made me so angry to think that these people would just knowingly run over an animal and carry on as if nothing had happened. The first time I saw it happen was a dog that lives a few houses down, who was run over by his ‘owners’ at a fair speed – they actually stopped and got out of the car and I stupidly thought they were going to take him to the vets, but they just laughed and shouted at the poor thing. He had a dislocated and broken leg, but like many dogs, he fixed up and now just has a war wound and a limp. I’m sure that Khao will heal up just like all the other animals that fall foul to the trucks and cars of the streets of Thailand. But I just wish that someone would learn – either the dogs, who could have a snooze at the side of the road, or the drivers, who could be more aware of what they are doing with their vehicles. 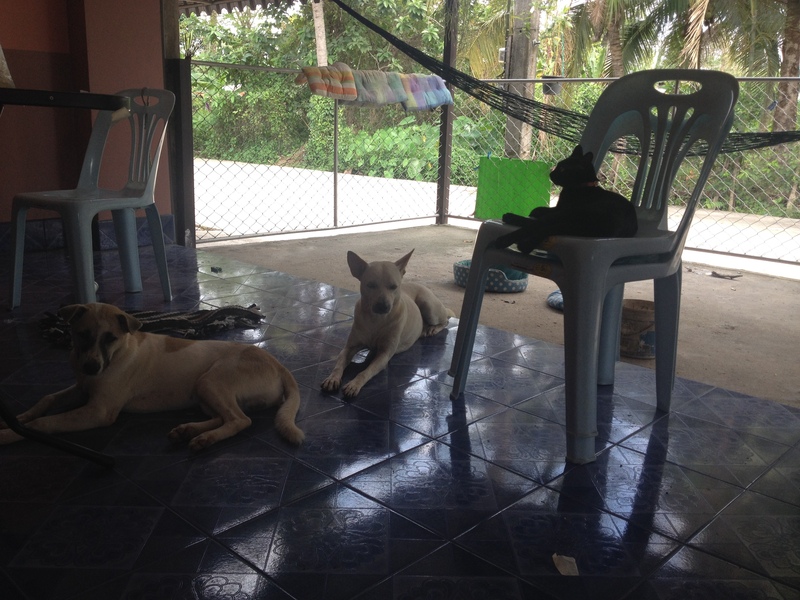 Posted on January 27, 2014 October 11, 2014 by cornishkyliePosted in Day to day life, Hat Yai, Random thoughtsTagged accident, animals, dogs, injured, stray, street animals, street dogs of thailand. We will be keeping a close eye on him, it’s a strange balance between caring for an animal yet being aware that he doesn’t belong to us in the way a pet does in the western world. It’s a sad situation but rather than being sad I am just angry! Thanks for your comment. So sad! I have yet to see a dog actually get hit here, but I have seen the aftermath. We have about 5 ski dogs here on our street and although I am wary around them, they seem pretty chill. I hope Khao heals quickly! So good to know that you care, and that you went to the vets to get meds. I do hope Khao heals soon!